body image.. always on a girl’s mind..
wow! your body transformation is really great in just 1 month! i have a 9 month old and just can’t get motivated again. i was in the best shape of my life right before i (finally!) got pregnant and now i’m the most horrid shape of my life. i just need some inspiration and time… and sleep! Such gorgeous pages! Glad you got a chance to do some art journaling! Love these pages! Your body transformation is really inspiring! You look amazing! I wish I had the motivation to art journal. Your pages are really inspiring and so so lovely. So happy to see you crafting! And you look amazing…super inspiring! 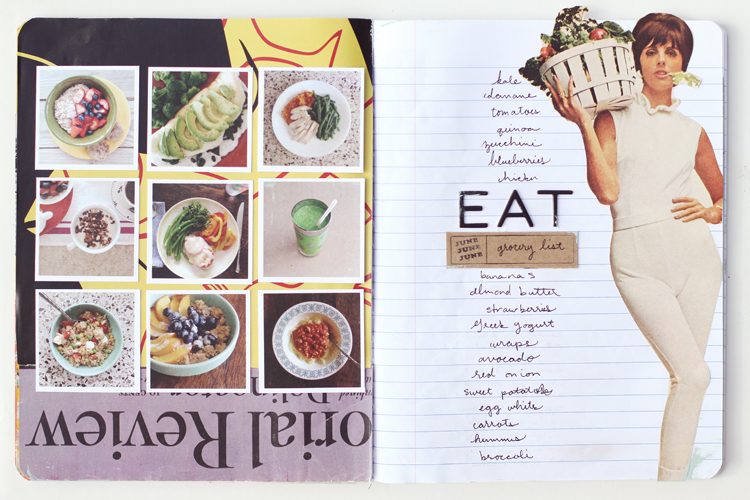 I’ve always wished i could make an art journal like this, but I’m never happy with how they turn out. I love your pages though! 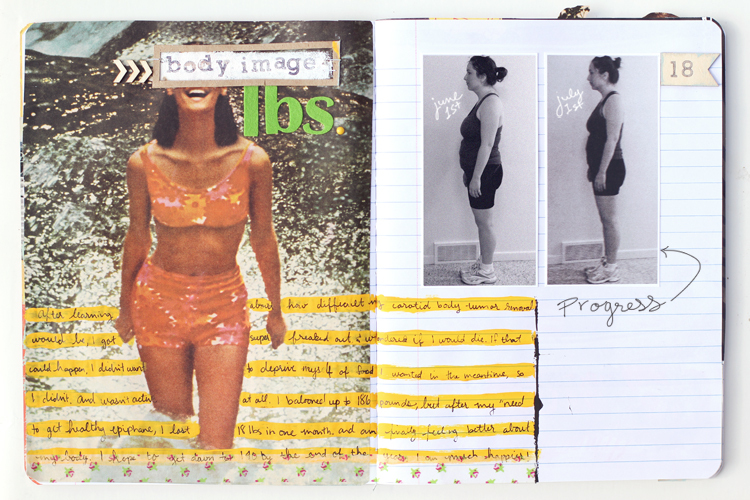 Your journal looks beautiful, Mandi! So creative and inspiring. 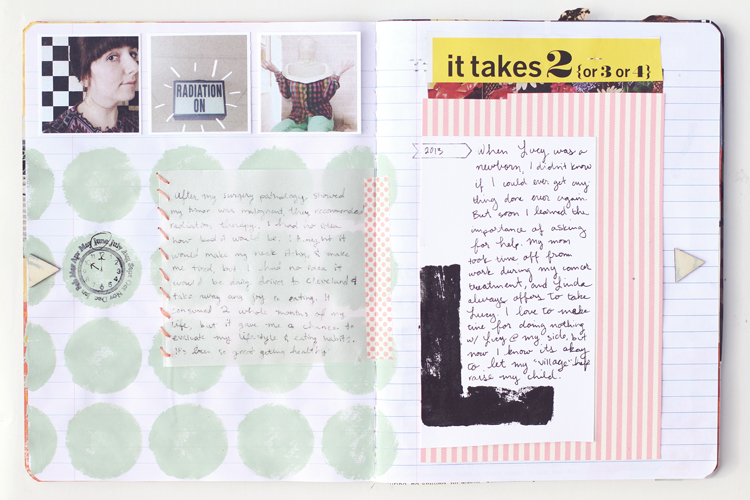 i love this way of journalling! This read and the art was inspiring for you and your journey, and inspiring for me! The honesty and creativity says so much about your strength! Thank you. These scrapbook pages are adorable!!! I forget that scrapbooking can be whatever style you want and not just the Creative Memories brand stuff that some people buy. I need to start documenting things like this for my girls! Also your tumblr is amazing so many good recipes! Keep up the good work! I follow you on instagram…so I couldn’t wait until I had time to look at your blog. There is NOTHING better than seeing you create. I am a advid scrapbooker, and I know you used to work in the field, AND we all know how artsy, creative, kinda girl you are. I LOVE it!!!!!! You always do such grand things like this! These are so pretty! You are just too good with your hands. OMG, Mandy! Cancer? :( I had no idea! I’d been trying to find your blog but couldn’t remember its name, I finally got to it today. You look amazing and so does your adorable daughter. Hope you’re doing great!